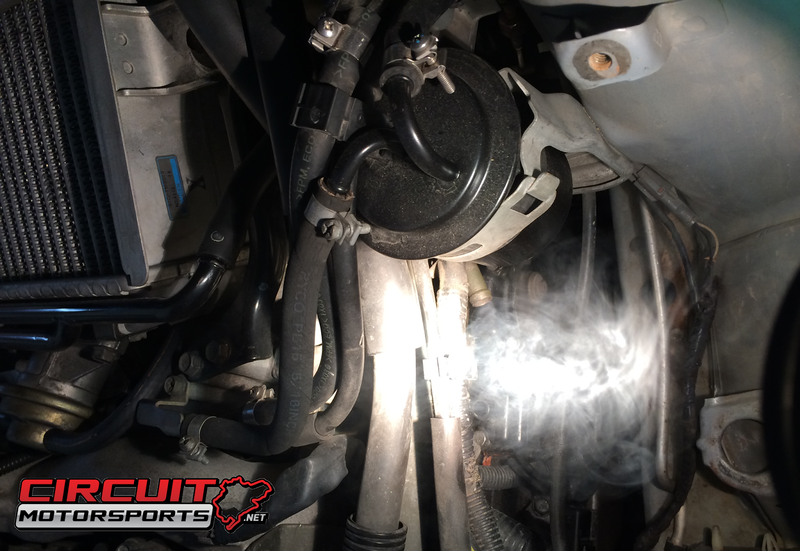 Circuit Motorsports: Flat-Out: The Smoke Leak Test - Why We Use it, and Why it Works. The Smoke Leak Test - Why We Use it, and Why it Works. Here at Circuit Motorsports﻿ we like to have the best tools for the job available for us. This allows to better service our customer's cars, and cut down on needless work time, which saves You time and money! One of the best tools we have is our Smoke Leak Machine. We love this thing. Why? This video will illustrate why! Modern Cars us a lot of Evap and Emissions Control Tubes and Airways. Turbo cars use even more of these tubes, pipes, hoses and fittings. Over time these rubber components can become brittle and crack. Once this happens you now have an "air leak". Depending on where this leak is, it can wreak havoc on your cars AFR and 02 systems, and cause serious issues with drive-ability and even reliability. If you have a leak After the MAF and Pre-turbo, you'll be introducing more air into your system than the computer has read and compensated for, making the car run lean and the AFR's erratic. If you have a leak Post-turbo then you are leaking air into the atmosphere that the computer has counted for, making the car run rich and making your boost numbers erratic. Both of these scenarios aren't good, and will make the car very hard to tune properly. Even on an N/A car you can have these same issues. Another cause of these issues is when yourself, or a shop, modifies your vehicle. When you have to undo 48 clamps and remove 24 hoses to do a job, that's a lot of small items to keep track of and make sure are sealed properly. Sometimes a connection gets look over or forgotten. Sometimes a clamp never gets tightened. Those old rubber hoses, once removed, can crack, fall apart, or just be too hard from use to properly seal again. Here at our shop we have seen this happen more times than we can count. A customer brings in a car that has had a handful of parts installed and they are ready for a tune, we always recommend a smoke leak test. The video above will illustrate why. A lot of small leaks can be hard to see or hear, but a small leak can cause big problems. The Smoke Leak Test machine is very simple, when hooked up properly, it will pressurize your intake system with a low PSI, then it pumps inert smoke into the system, any leak will immediately show a small or large plume of smoke coming from the source of the leak. Very simple, but extremely effective. If you have had parts installed on your car and are looking to get it Tuned you REALLY want this done. Why? Because if you bring your car to us to get tuned, or any shop for that matter, and you get your dyno appointment set, you pay your hard earned money and get the car strapped onto the dyno, and then the tuner starts his tuning to discover you have an issue such as a leak, you just wasted all that money. The car has to be pulled off the dyno, and depending on the shops equipment or availability, diagnosed, fixed if possible, and then put back on the dyno. That may take hours or days. Then the car can be put back on the dyno, most of the time at a later date, as Dyno schedules and tuning are booked way in advance. We have seen this happen all to often. A few simple tests can go a long way before getting a car tuned or preparing it for a track day, event, race, etc. This is something we are big proponents of here at Circuit Motorsports. We also really recommend a leakdown and compression test before a tune to make sure the engine is in good health, but we'll cover that in another post! Check out the video, then if you have any questions comment below! Do YOU need a Smoke leak test? Do you have erratic idle, lean AFR, boost leak, etc.? We can find your leak and fix it FAST. So contact us ASAP for an appointment. 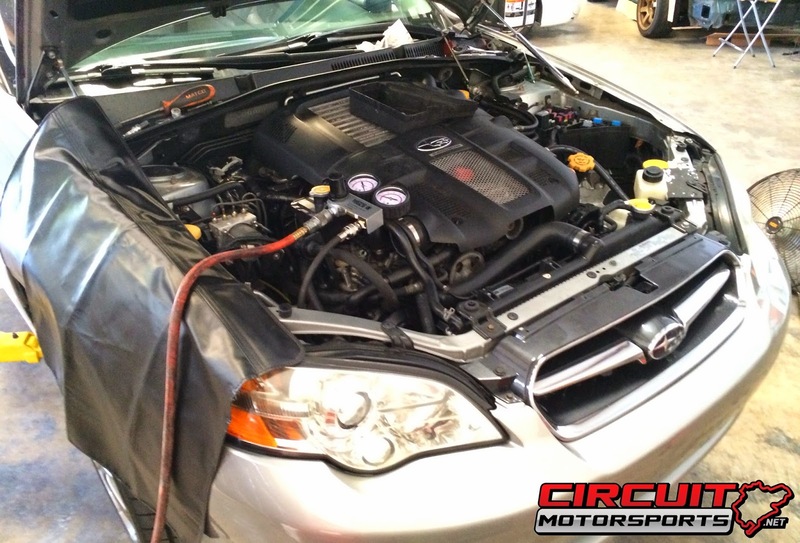 Circuit Motorsports is a Performance Auto Shop located in Orlando, FL. We specialize in Subarus and all performance cars, both Import and Domestic.